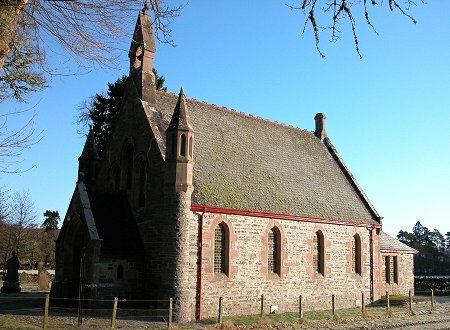 Cannich lies towards the southern end of Strathglass, which runs south west from Beauly and carries the A831 for 17 miles into the heart of the western highlands. In Cannich the A831 takes a sharp turn east and heads towards Drumnadrochit on Loch Ness. If you are approaching from Beauly it's difficult to believe today that the fertile Strathglass was once home to large numbers of people: and to a thriving and widely-famed industry in the production of illicit whisky. The stills were cleared when the Clan Chiefs of the Chisholms forced the people from their land in the years up to 1830 to free it for more profitable use: grazing sheep. 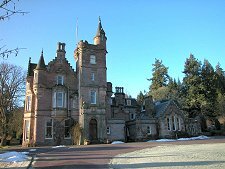 The Chisholms later left, and others now occupy their clan seat at Erchless Castle, close to the confluence of the River Glass and River Farrar. Not far away, and more visible from the main road is the strikingly attractive Aigas Field Centre. 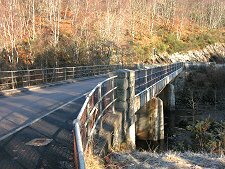 Cannich itself is approached from the north across a bridge over the River Cannich. 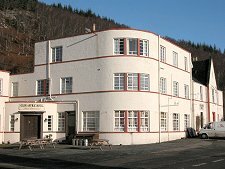 At its heart lies the Glen Affric Hotel, now sadly closed. This was originally built in 1862 but its striking and very unexpected architecture is evidence of considerable extension in the first half of the 1900s. The village is home to a surprisingly large community whose homes, churches and other services are slightly scattered and in many cases hidden amongst trees. 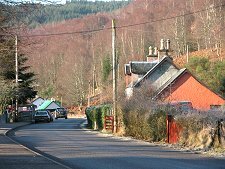 Cannich lies at the head of two long and exceptionally remote glens. 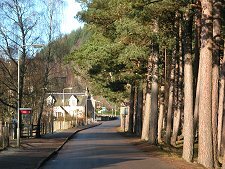 From the crossroads in the centre of the village a road leads south west for ten miles into Glen Affric: which then continues roadless for many more miles, ending not far short of the west coast at Shiel Bridge. The fourth road meeting at Cannich crossroads heads nine miles west along Glen Cannich to the dam at the head of Loch Mullardoch. From here the loch extends ten miles west, deep into very remote and mountainous country. Between the 1830s and 1950s much of this landscape would have been very empty, largely given over to hunting and fishing estates. This all changed with the coming of the North of Scotland Hydro-Electric Board to these glens. In 1952 the Mullardoch dam was completed. This generates electricity as its water descends through a tunnel to Loch Beinn a' Mheadhain in Glen Affric. From there it passes through one of the largest hydro power stations in Scotland at Fasnakyle, a little south of Cannich. Today's Cannich continues to provide employment on the many hydro schemes in the surrounding area, and forestry also makes an important contribution to the local economy. And with large areas of high mountain country on the doorstep, leisure is increasingly important, with hotels and B&Bs in the area and a camping and caravanning site and a youth hostel in the village.